The village of Milton was originally a small cluster of buildings adjacent to the church of St Mary Magdalene. There was a post office on what is now the site of “The Wheatsheaf” car park. The Post office was the only one in the district and served in that location for 90 years. It was pulled down in the 1950 and the post office service moved across the road. Next to the post office was “The Wheatsheaf” public house. This was half the size of the premises of today as can be seen from the photograph dated from 1904. The licensee in 1880s was a Mr E Turner. A Mr J Strutt took over in the 1890s and he in turn was succeeded by a Mr A. Oakley. Next to “The Wheatsheaf” pub was a grocery store run by Mr E Chipperfield. This has now been developed and integrated into “The Wheatsheaf”. The grocery store sold general goods and drapery. Next door to the Grocers store was a blacksmiths forge and home. For many years this was run by a Mr Brownen. It was finally pulled down in 1954. “The George” Public house was pulled down in 1904 and replaced with the magnificent red brick building still in situ today, although sadly no longer a pub. At the time of the 1904 photo the licensee was a Mr Charles Taylor. To the east of “The George” was a butchers shop. This property was an old cob cottage. As well as being a butchers it was also a slaughter house and cattle would be herded here to be reduced to meat. 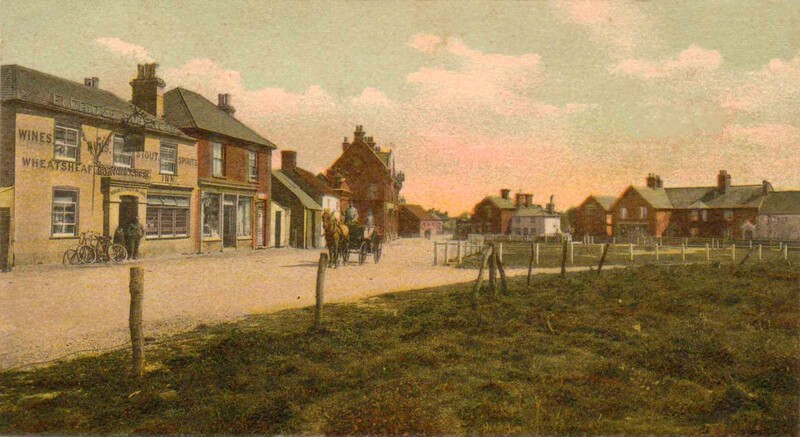 In the 1910 photo you can see in the background, at the junction of what is now Old Milton Road and the A337 Lymington Road was a School built on a triangle of land. This was opened in 1836. The playground was the road! On the opposite side of the road was a cobblers, a saddlers and a bakers. It is interesting to note that the choir at St Mary Magdalene church were, for many years, not financially rewarded for their services. They were however paid in kind. They were entitled to visit either “The Wheatsheaf” or “The George” and take their payment in the form of a pint of beer. The Milton of 1910 was a wonderful, self contained village.